For the artistically stunted among us, the idea of labouring intensely on murals while perched on ladders, cranes and cherry pickers for days or weeks, only to have our beautiful images tagged with graffiti or smashed to rubble, is a profoundly depressing one. But for street artists, it’s a singular thrill. Temporariness is part of the game. When I stand in an empty old movie theatre, the Star Lyric in Melbourne’s Fitzroy, looking at an enormous, delicately drawn female face, two storeys high, the thought that it will amount to a painted pile of rocks in a few days is difficult to stomach. But the artist, Rone, created it knowing that the building would be destroyed by developers shortly after his current exhibition, Empty, closes. A finite lifespan, he says, is what makes street art singular: it blooms suddenly, then is exposed to the elements. “The temporariness is what makes it contemporary, of the moment, and more important or special,” he says. Rone, whose full name is Tyrone Wright, is arguably Australia’s most commercially successful street artist. The 35-year-old, dressed in a black cap and t-shirt with a paint-splattered grey hoodie, cites British street artist Banksy as an influence and shrugs off accusations of being a “sell-out brand” by pointing to the fact that he gets paid to make art, something that would have seemed impossible ten years ago, before the mysterious and remarkably popular Banksy dragged it into the mainstream. And he is shrugging all the way to the bank — or airport lounge. 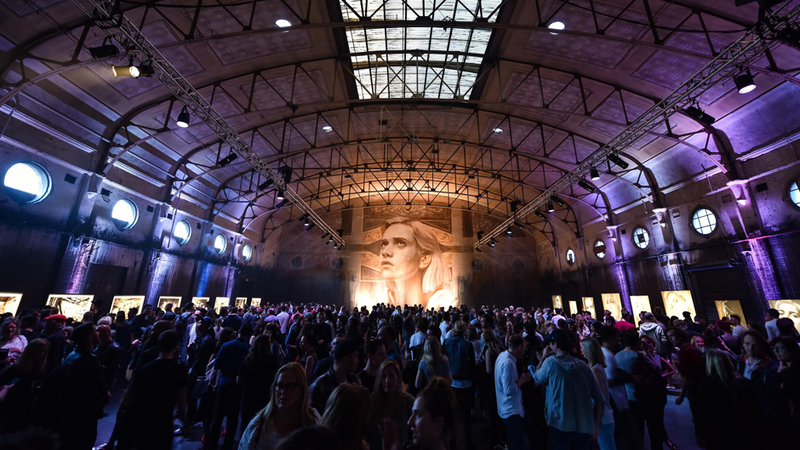 Now an internationally renowned artist, Rone has exhibited in London, New York, San Francisco, Miami, and painted murals in a host of places around the globe including Canada, Taiwan, Malaysia, the UK, France, Germany, Japan, New Zealand, Jamaica, Dominican Republic, the US, Germany, Japan and Mexico. And every single work in his new exhibition had been sold before it even opened. In it, he explores vacated houses, abandoned spaces and ghostly reminders of lives lived before places were left silent. He spent months searching for them, driving, walking, riding his bike, trying to find the perfectly putrefying canvas that had not already been trashed with graffiti. The ghostly traces of the women he paints on crumbling walls are meant to remind us of life. They are strong faces, defiant, sexual, contained, mute. It’s not spooky, but “it is a little haunting, the soul of a space”. In another, he tried to stand on a couch soaked with “the grossest water ever” that filled up his shoes. In truth, these places are anything but empty. They are crumbling, reminiscent of worlds past, of houses once crammed with life, jammed with broken furniture, blackened beds, fireplaces filled with ash. To paint, he had to scrape off mould, straddle rain-soaked couches on wobbling planks. Next to Rone’s desk in the warehouse space he shares with a collective of other artists — who wander around in paint-splattered boiler suits — is an old metal fan, its plastic centre melted into long loops; a keepsake from a burnt-out house. In Rone’s world, women loom large. Along many of the footpaths and underpasses in Melbourne, where he first made his name as a street artist, they float above passing traffic, gaze over the head of pedestrians and, with the battering of rain and sun, their faces crumble, fade and pall. He wanted to do the opposite, a “non-aggressive, non-sexual, beautiful image of an unknown woman”, putting that next to the vampires as a contrast. “I fell in love with the way it worked on the streets — it would decay or fall away — just the eyes would be left, but still beautiful. While beforehand, he had been using more aggressive, masculine motifs — skulls and military designs — the female faces shone next to the other graffiti. “Women are the ideal image, for me, to paint; a guy has an often aggressive or masculine overtones; with women there is strength and fragility,” he says. Since then, the ideas of beauty and decay have been marbled throughout his work. “I have been researching beauty lately,” he tells me. The women appear simply conventionally pretty, but Rone’s work is quietly subversive. When commissioned to paint an AFL-inspired mural for a Melbourne five-star hotel, for example, he chose to paint the faces of female fans, not male players. When commissioned to paint a mural in mostly Muslim Penang, in Malaysia, he struggled, but eventually won, permission to paint a bare female face in a place where most are covered. And, in a part of Mexico known for brutal killings of women, he painted strong female faces which will, perhaps, serve as more reminders of loss. The irony is that Rone is intent on placing faces of women in spaces where they would not feel safe. Women looking at his images in abandoned lots might see a different kind of Jane Doe; a fearful, haunted woman. They might also reflect that some women are raped or murdered while walking through the same spaces Rone paints in, quietly, rapidly, ears cocked for any approaching footsteps, ready to run at first intrusion. For a man who embraces rot, decomposition and deterioration of lived in spaces, Rone is remarkably chipper. What strikes you upon meeting him is how bright and cheerful he is. Half an hour later the cat is crouching on top of some shelves near a desk, and Rone stands there chuckling, staring at it, shaking his head, wondering how it will get down. In a few days the Star Lyric building will be smashed. Another woman, painted large on a wall, lit by shafts of light from high portholes, who is, disconcertingly, mute then crumbled. It’s part of what Rone calls “the fragility of the medium”. And in this way his work becomes the very idea he is constantly probing: emptiness. Absence. And a wondering not just about what might have been, but what is yet to come. Posted in ABC, Columns. Bookmark the permalink.